Introducing the new 2018 Indian Motorcycle Guide. Indian Motorcycle, America’s First Motorcycle Company, Expands to 16 Models for 2018 In 1901, Indian Motorcycle became America’s first motorcycle company. Since then, the iconic brand has captured the hearts of motorcyclists around the world through its dedication to legendary acts, industry firsts, racing dominance, and innovative design. When Indian Motorcycle relaunched in 2013, it roared into the Sturgis Motorcycle Rally with an all-new 3-model lineup. Over the last 4 years, Indian Motorcycle has proved that it has no intention of slowing down. An ever expanding lineup, unrivaled engineering, and industry-leading technology have catapulted the brand into the 21st century and honored its iconic name. Indian Motorcycle presents a 16-model lineup—an impressively wide product offering that ranges from the 999cc liquid-cooled Scout Sixty to the ultra-premium Roadmaster Elite embellished with 23k gold leaf badging. The stripped-down Scout Bobber, the blacked-out Springfield Dark Horse and the ultra-premium Roadmaster Elite are new for the 2018 lineup while other models receive significant upgrades and new paint schemes. Notably, the Chieftain Dark Horse gets a 19” ten-spoke blacked-out wheel and Ride Command—the largest, fastest, most customizable infotainment system on two wheels. 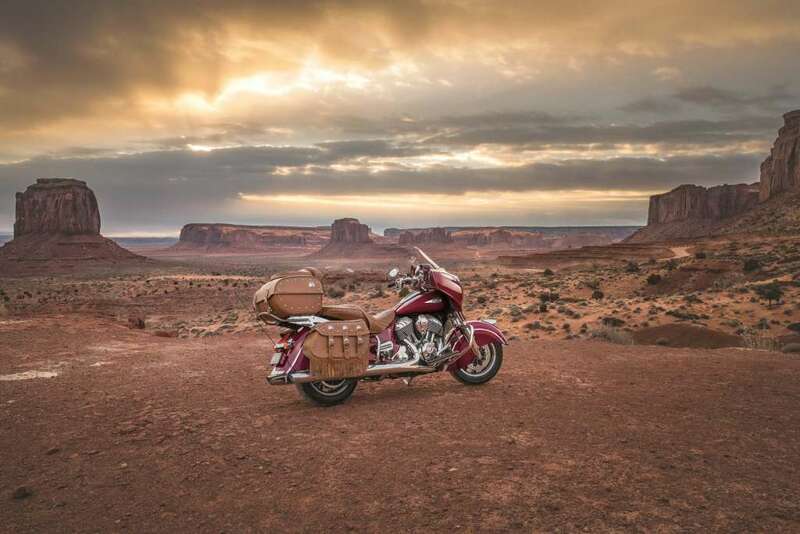 Indian Motorcycle, America’s first motorcycle company, elevated its 2018 Indian motorcycle lineup from its entry-level Scout Sixty to its long-distance touring Roadmaster. Along with the newly introduced Indian® Scout® Bobber, headlining the 2018 Indian model year is the ultra-premium Indian® Roadmaster® Elite and blacked-out, toughed-up Springfield Dark Horse. Also receiving a noticeable upgrade is the Chieftain Dark Horse. Riders will see a 19″ ten-spoke blacked-out wheel with an open front fender and the industry-leading Ride Command infotainment system now included standard. A limited production model, the ultra-premium Roadmaster Elite features custom-inspired two-tone candy paint that takes 30 hours to complete and is finished by hand, with real 23K gold leaf badging on the tank and lowers.The Roadmaster Elite comes standard with a large number of premium amenities, including the industry-leading Ride Command system, a 300-watt premium audio system, passenger armrests, billet aluminum passenger and driver floorboards, a premium touring console, and stylish pinnacle mirrors. Joining the Roadmaster Elite in 2018 is the Springfield Dark Horse – a blacked-out, toughed-up bagger. Similar to other Dark Horse models, the Springfield Dark Horse features matte black paint with gloss black details. The Springfield Dark Horse features an open fender to showcase the new 19″ ten-spoke, blacked-out front wheel. Its quick-release windshield features a blacked-out bracket. The stylish windshield protects riders from the elements, or can be easily removed to give a more mean, slimmed down look. Continuing through the 2018 Indian lineup, the Chieftain platform receives notable upgrades – adding a Chieftain Classic model that will feature the brand’s iconic valanced front fender and genuine leather seat with fringe, available in three colors, including Indian Motorcycle Red, Thunder Black Pearl and Star Silver Smoke. The Chieftain Limited, remains at the head of the pack and adds three new color, including Thunder Black Pearl, Blue Fire and Bronze Smoke. The Chieftain, available in Steel Gray, receives a lowered price of $21,499, and also receives a 19″ blacked-out ten spoke wheel and open fender as standard. For those looking to add a more modern style, the 10-spoke 19″ wheel, in both black and contrast cut, along with an open front fender, are available as an accessory for the Roadmaster, Roadmaster Classic, Chieftain, and Springfield motorcycles. The wheel and open fender will fit those models from model year 2014 onwards. The Indian Chief Classic also receives upgrades, now available with white wall tires, wire wheels, and full chrome hand controlsand it is available with gorgeous Burgundy Metallic paint. Indian’s iconic Chief Vintage line receives new offerings for 2018. Thunder Black and Star Silver over Thunder Black will for the first time ever feature black genuine leather saddlebags and seats to add to its beautiful styling. 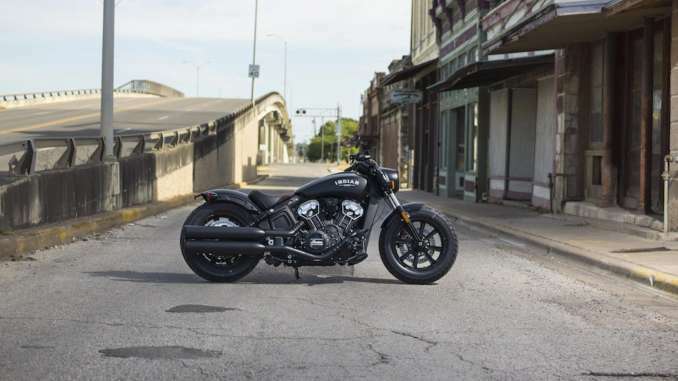 Joining Indian’s recently announced Scout Bobber in the 2018 Indian lineup is the Scout Sixty and Scout. The Scout Sixty receives two new colors, including Polished Bronze and Thunder Black over Titanium Metallic. Meanwhile, the Scout receives a new look and improved performance. Now standard are a cartridge fork front suspension and Pirelli tires, along with passenger accommodations, including a genuine leather passenger pillion and pegs. Scout receives two new colors for 2018, Metallic Jade and Willow Green over Ivory Cream. Indian’s 2018 model lineup will be available at dealers in the U.S. and Canada starting in September.